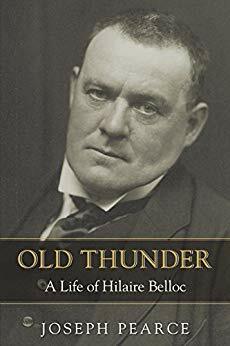 Hilaire Belloc, born in France of a French father and an English mother was as much an outsider as a Balliol man could be, in Edwardian England. 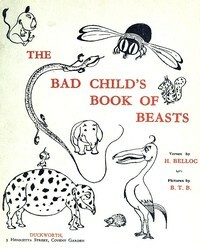 He married a Californian, and in the happy early days of his marriage achieved his first literary success with The Bad Child’s Book of Beasts, which a century later is still acceptable to my ten year-old. My fourteen year-old read the entirety of the sequel, Cautionary Tales for Children, out loud and with relish. Belloc also made a name for himself as a travel writer. As a young man he had trekked across 19th century America to woo and win his wife, Elodie. In 1901, he challenged himself to walk from Toul, in eastern France to Rome, Italy—in a straight line, right across the map, more than 500 miles. He very nearly managed to pull off this stunt, hiking straight up over the peaks of the Jura mountains, but a blizzard in the Alps forced him to detour through a pass. The story of his journey, The Path to Rome is part comic epic, part spiritual pilgrimage. It was, he said later, the only book he ever wrote for love. Published in 1902, it features Belloc’s own exquisite illustrations, sketched at stops along the way. In it he described the French border town in which there were more soldiers than citizens; the ancient village forcibly garrisoned; the newly built bunkers; the modern movable guns; the wire entanglements marking the frontier. But his tone remained lighthearted, tongue-in-cheek humor from Lorraine to Tuscany. No sinister foreboding whispered that World War I was about to destroy everything he described. In February 1914, Elodie died suddenly. Belloc was forty-four. He found himself with five children to raise alone. By the end of that calendar year, the Western front had claimed 1,800,000 casualties, barbed wire strung from the Alps to the North Sea. The Moselle valley that had marked out Belloc’s straight line to Rome had become No Man’s Land. Chesterbelloc.” But whereas Chesterton was well-liked, even by his adversaries, Belloc’s aggressive style aroused often intense resentment. He became preoccupied with Calvinism, and the chapter called “What was the Reformation” in The Great Heresies is weirdly skewed by his determination to make John Calvin personally responsible for all the ills of the modern world. 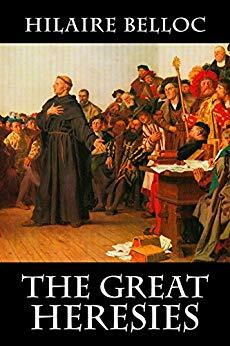 And yet, “The Arian Heresy” in the same book is a feat of succinct distillation: in this chapter, he takes the first five hundred years of Christian theological controversy and in thirty pages sketches out the salient points to present the topic so cogently that an ordinary reader can get a handle on it. 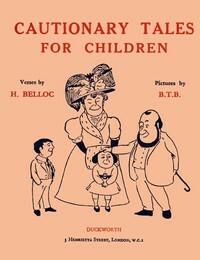 If you’ve ever tried to approach this subject and given up in hopeless confusion, Belloc is your man. There’s no question that he had a genius for the apt, quick sketch. When he focused on a single individual, the result was a cartoon. But when he stepped back and surveyed a vast, cluttered field, he was able out of the mass of detail to evoke a coherent landscape. At age sixty-five, after recovering from a stroke, he set off on another pilgrimage, to the Holy Land. 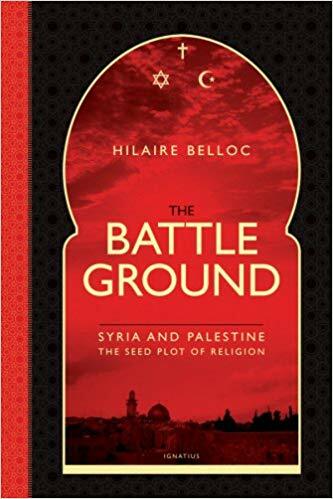 The ensuing book, The Battleground: Syria and Palestine begins where no one else does: with the lay of the land. He brings together aspects of ecology, anthropology, archaeology, history, philosophy and theology to delineate a strikingly cogent overview of a notoriously murky topic. Reading this book, for the first time I began to grasp what people in that part of the globe have been fighting over for so many centuries. Published in 1936, Belloc’s insights into the future importance of the Muslim world were uncannily prophetic. He perceived that the religious fervor of Islamic countries would inevitably come to challenge the cultural fragility of a spiritually desiccated Europe. In 1941, Belloc’s youngest son, Peter was killed while on active service with the Royal Marines. After this blow, he was unable to rally again and suffered a long, slow decline for several years until his death. Back in the days when London was the center of the English-speaking world, and Oxbridge intellectuals wrote for and against each other with very little thought of any other audience, Belloc was known as a Catholic polemicist with a vicious talent for skewering his opponents. From the vantage point of the next century, however, it’s his wide angle works that seem more important. The Free Press is as pertinent today as when first published in 1918. It will inspire anyone who believes that “to release the truth against whatever odds . . . is a necessity for the soul.” Anyone struggling to persevere as a Christian in the fields of journalism or media should read it. His children’s books have an acerbic humor that will appeal to bored veterans of political correctness, especially teens. 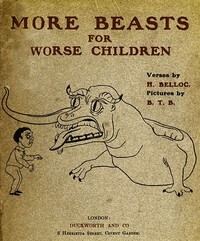 (More Beasts for Worse Children reads like a ruder, funnier Dr. Seuss, according to my daughter). The Battleground will provide food for thought for anyone interested in the Middle East. Belloc had a talent for enlivening any topic he turned his hand to with a characteristic verve. 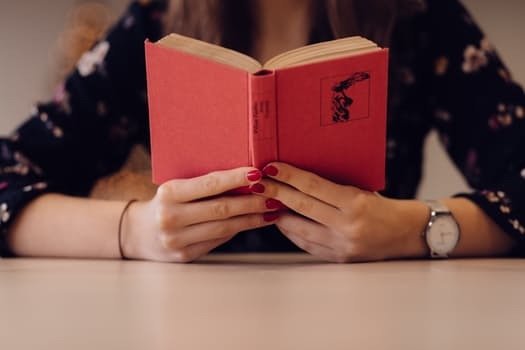 Selections from his work could be useful to teachers trying to spark debate, keeping in mind that he tended to embellish his arguments with rhetorical flourishes, so other sources should be consulted for balance. Belloc himself hoped to be remembered for his Poetry. He had a gallant side too, and he defended a feminine ideal that respected motherhood. But for profounder meaning in her face.